This is fun family pizza night. Skip delivery! Just get some some premade pizza dough or may your own easily enough. Few toppings and a few minutes and you have fresh awesome pizza that your kids can decorate. You can have a pizza party where everyone can put something different on their own pizza. Cooks so fast you will be amazed. Assembled easily and have now tried out once. Will use more fuel next time to get heat high enough. Takes about 1.5 chimney worth to get high temps needed for yummy pizza. Looking forward to the next round. Ordering online was fast and easy. I immediately received confirmation of my order via email and received shipping information that enabled me to track the order. No need to track…it arrived within 2 days although I did not order expedited shipping. Fortunately, because the company is located in MA and I live in MA, that shipping time was super quick! Product was nicely packaged and the quality is sensational. 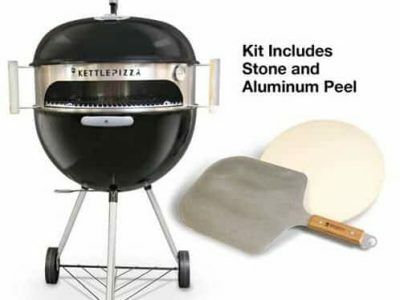 This was a gift for my husband who loves pizza and loves grilling so this is the perfect present for him. He is eager to start using it!! We saw the story of the company on “Chronicle”…great publicity!! Made in America is a nice feature and employing disabled/challenged workers is another plus! This company is wonderful to work with! I mistakenly ordered the wrong grill online and was thinking it was too late to change it. It was a Saturday and the owner called me himself when he got my email and assured me it would be taken care of. It was!! The grill is awesome, my son made pizzas on Christmas with it and they were perfect!! I highly recommend this product and company! We are pizza lovers! Not the usual type of pizza, but ones made from scratch with many wonderful combinations of vegetables and nontraditional sauces. Our pizza oven arrived and we could not wait to make our first Kettle pizza. The oven was marvelous and the pizza fantabulous! 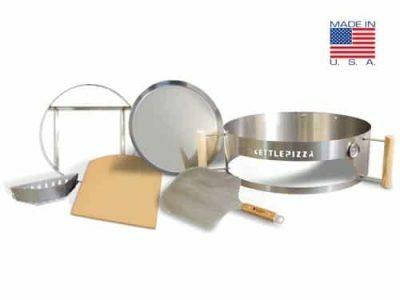 A great product for those wanting the taste of wood fired pizza. I know we will enjoy using ours several times a week. Great reviews. Considering purchase. Does the oven kit handle two pies at the same time? This product is excellent. The first test run, we cooked a Roasted Garlic Chicken pizza and a pepperoni, mushroom, onion, and olive pizza and served them to friends. They both were amazing. It was easy to build, install and use. Can’t wait to use it again. We had thought about building a pizza oven in our backyard but quickly realized that that was not an option. Within minutes of cooking the first pizza in the KettlePizza, it was obvious that this was the perfect alternative. The pizza was delicious!! One of the best purchases we have made! We highly recommend it. From the simple ordering and helpful staff to the quality of the product, this is an amazing company. I am so pleased to have purchased this for my husband. Our first attempt produced an amazing bacon and onion pizza with a hint of apple flavor from the recommended Applewood chunks. Thank you, Laurie for all of your help! 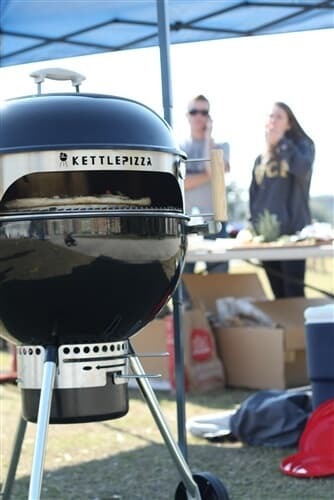 Well we tried out our newest grilling accessory today and we have to say AWESOME. The pizza was literally done in about 5 minutes. We have to work on our dough skills but they came out very good. 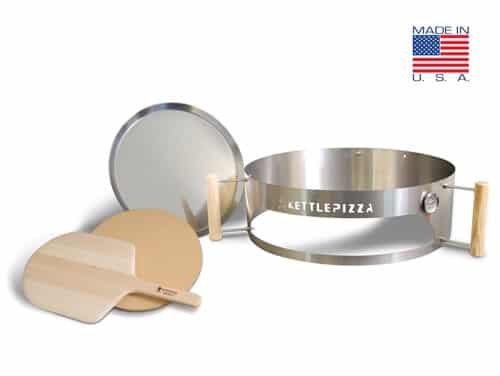 We would also like to say that the customer service with Kettlepizza is awesome. We had a great experience working with them. 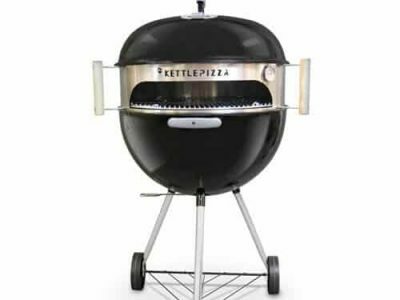 If you like wood fired pizza and can’t afford the big wood fired pizza oven for your back yard this is a great alternative for you. I have one kit and it works so well I bought a second. George and staff figured out how to ship to Kauai and even found a lower shipping price than quoted. We now make deep dish pizza on the North Shore of Kauai. I can’t rate it yet. I got it as a gift for my husband for Christmas! I’m sure it will be wonderful!!! ordered it and immediately love it after our first try. a fun social way to cook with delicious results. This is a nice option to the Weber Grille. Made awesome pizza the first time After the initial set up of the pizza kit. 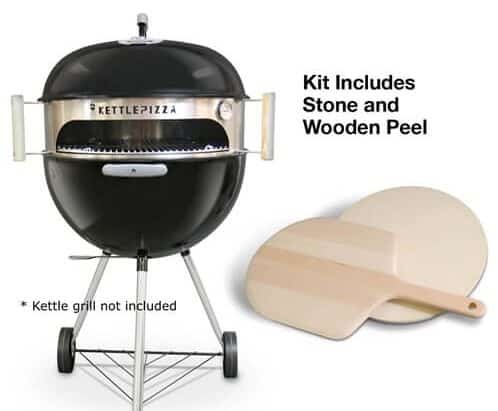 You simply set your charcoal up towards the back of the grill, with the pizza stone toward the front. Once the charcoal is on it’s way you have to add the wood chunks( we used Weber apple chunks). 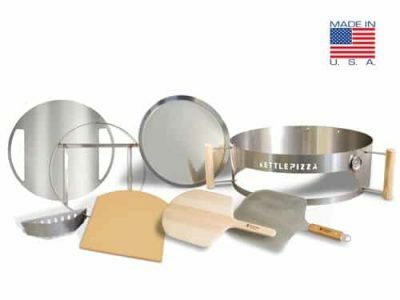 This will create the 700 + degrees needed to cook the pizza properly. A couple of tips….1 Turn your Weber grill grate upside down, so the charcoal access grates fall down, this makes it easier to add the wood to the charcoal. 2. Put the pizza stone in the second you light the grill so it warms up the whole time. 3. Rotate the pizza during cooking. I hope you enjoy it as much as we do!